Our patented “SPAGHETTI” micro fibres were developed and patented as a means of filtering oil and hydrocarbons from water, aqueous solutions and moist air. The Patent** employs two basic principles. The “flow-through” principle in this patent states that these liquids, vapors and gases will pass easily through the free openings and passages between the bands of spaghetti, but are nonetheless whirled therein, further favoring the removal of oily substances. Simply put, liquids, vapors and gases can be filtered using spaghetti without using additional pressure to force them through as you would with other filters. Therefore they allow for filtration with far less reduction in the flow through rate of the substance being filtered. The simplicity of this product makes it remarkable. 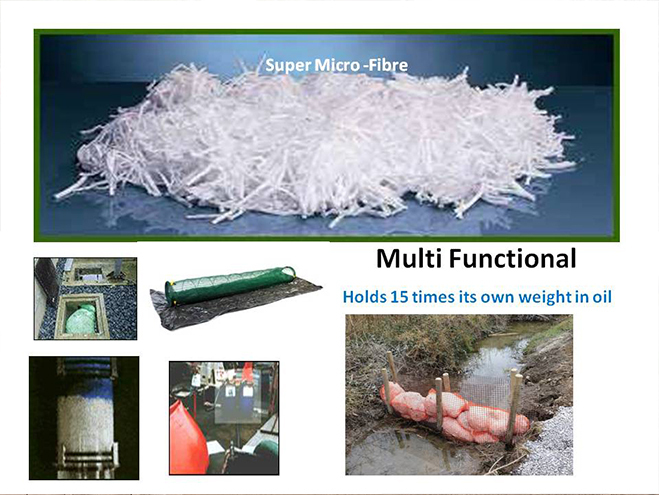 These entwined fibres can cause a filtering action in virtually any size or shape container in which they are placed. Their use is only limited by your imagination. These barrels are packed with Microfibre, each barrel is also perforated at the bottom to allow the filtered water drain. Applications include river spills, cleaning out fiel bunds. 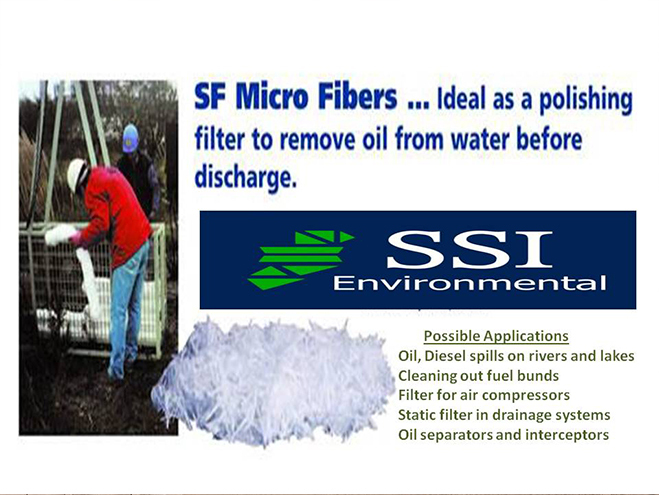 Micro Fibre In Filter Barrels. Filters oil from water as it is pumped through. Micro Fibre loose in pipe system. Used micro Fibre Filter Bags, black with oil. Easy to dispose of. Thin soft strands of loose polypropylene for maximum surface area and absorption. Available in 50 Kg boxes. Filter Barrel containing loose pre-packed Micro Fibre. Each Barrel is perforated allowing the filtered water to escape.